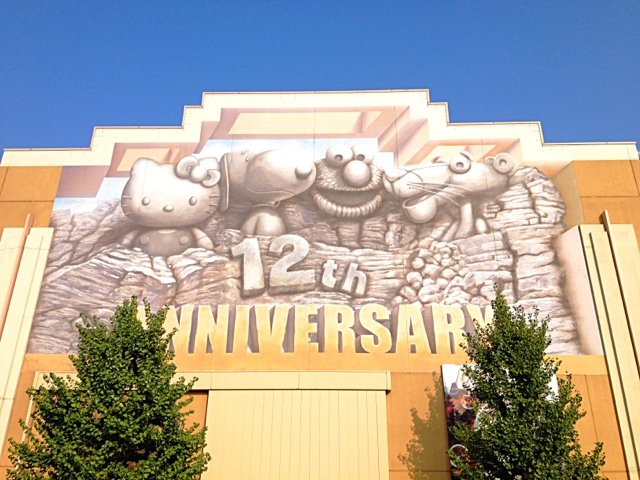 Universal Studios Japan (USJ) in Osaka is a popular tourist spot great for families to spend a day. 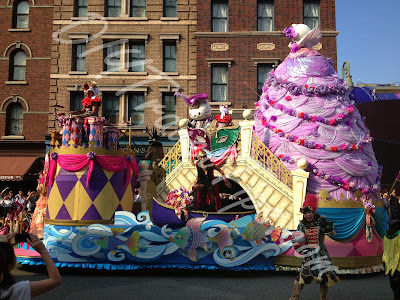 But having been there, I feel the lack of crowd control is a major draw back because rides are always having very long queues. Tickets can be bought in advance at USJ or Osaka train station. I believe it should also be available at Shin-Osaka station too. Highly recommended to do so especially if you are visiting on a weekend. Skip the long ticketing queues! For online purchase, do not bother unless you can read Japanese because only the Japanese website allows online purchase. Also, I was told you may need to have a Japanese credit card or address. Personally, I have not tried it before so I welcome any confirmation. You will be given a brochure upon ticket purchase. 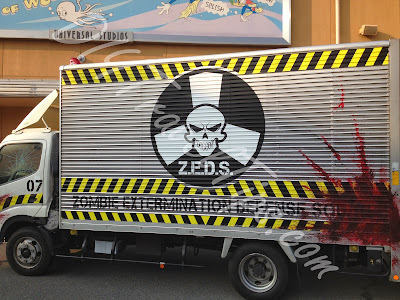 The English version is simply a map, but the Japanese version is a booklet which describes each location and even any special event ongoing (mine was the Halloween Horror Nights), which will be useful to know where the special events are happening. So be sure to ask for the more detailed guide. 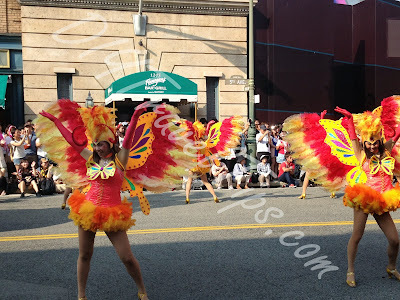 You might encounter difficulties conversing in English with the ticketing staff. In fact, during my Japan trip, I have met relatively few service/front counter staff that could speak and understand English well. So just try your best to let them know what you want or find someway to translate and write down the Japanese characters on a piece of paper first. All introductions and narratives, including shows, were in Japanese, so take that into consideration if you decide to go for any shows. 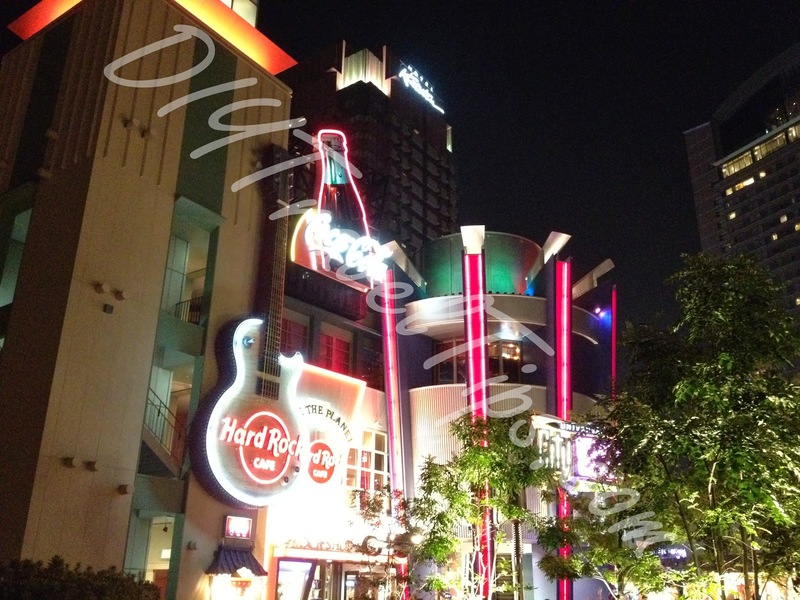 Universal Studios is next to the JR train station UniversalCity stop. Take the Osaka Loop (大阪环状线) to Nishikujo station (西九条站) and wait for the JR Yumesaki line (JR ゆめ咲線) in the middle platform. 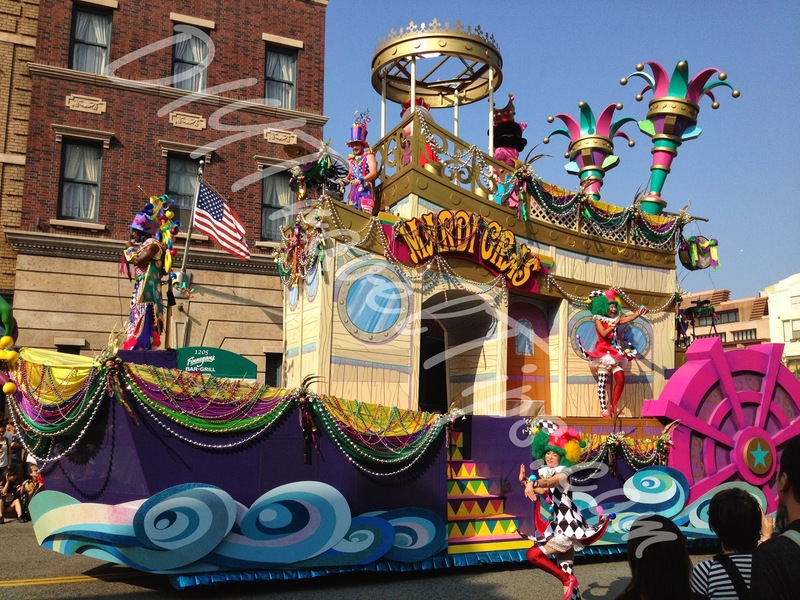 If you are lucky, you may get to board the special Universal Studios decorated train. As I went on a Friday which coincided with a Japanese holiday (Respect The Aged Day) the following Monday, it was a long weekend for the Japanese. Plus that day was also the first day of the Halloween event, there were just too many people. It was obvious that the place could not handle such a big crowd as almost all rides had 2 hrs of waiting time soon after opening. Upon reaching, we went straight for the Spiderman ride first but there was already a 70 mins waiting time soon into park opening. We decided to skip Spiderman and went for the Jurassic Park ride. Signboard showed 20 mins waiting time but it felt more like an hour. Having tried the Singapore version, I find minor differences between the two. The boats have rows of front facing seats compared to circular seating in Singapore's version. The plunge towards the end also felt higher in the Japanese version but otherwise all the Jurassic scenery remained much the same. Tip for Jurassic Park ride - Bring along extra clothing or newspaper if you do not like to get wet. Middle of the boat is obviously the driest spot. If you are assigned to the sides, use the newspaper or something that you can use to cover shoulder and hands to minimize wetting your own clothes. After Jurassic Park, we skipped to the nearby Jaws ride which had a 35 mins waiting time. Waiting in the queue definitely seemed longer. Once on the boat, we could not understand a single word of the Japanese narrative, but we did understand no photo taking was allowed. The fire effect was good but otherwise, it was a very short and quick ride. Tip for Jaws ride - Sit towards the left in the direction of boat travel for a surprise! By now, Spiderman ride was at 120 mins waiting time. I also found out (too late) that the Biohazard the Real event which I was really interested in, was only available to participants whom had a blue ticket. This is an action shooting event (or so that I have read) where participants are given mock weapons and shoot at monsters from the game. Unfortunately for me, due to overwhelming response, the ticket distribution finished very early. I could not find any online mention that a ticket was needed, not even in Universal Studios' own article describing the event. Maybe the lack of reviews for this event was because it was advertised mainly in Japanese. So for those interested, go early and queue up for a ticket. It is just next to the Spiderman ride on the right. You cannot miss the special umbrella uniforms that the staff are wearing. The Japanese brochure also mentioned the survival rate is still 0%. It was a very hot afternoon so we went into the nearest show for the aircon. 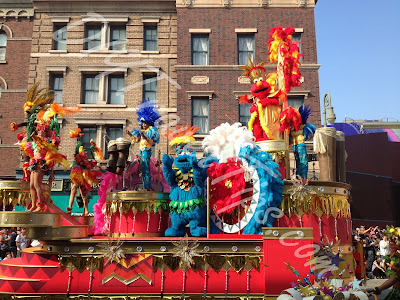 It was the Monsters Rock and Roll live performance, a 30mins show with songs from Bon Jovi and Christina Aguilera but normal dialogue between characters are in Japanese. We finished the show to find Spidey ride was now 90 mins. It was also then that we discover there was a singles queue at 60mins. We decided to try our luck with the singles queue. How fast your turn comes really depends on your luck. 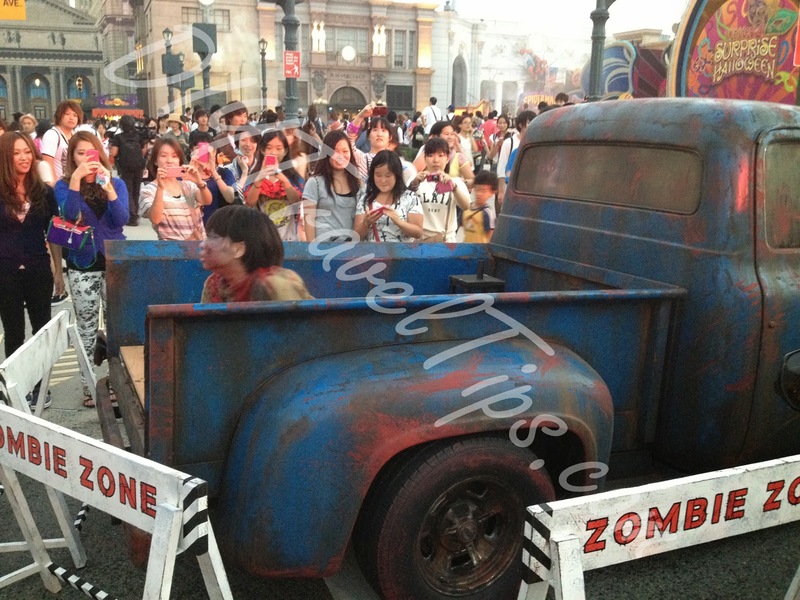 The ride was a 4x4 car and only rows with 3 persons would have a free slot for one person from the singles queue. So if there are many 3 person groups in the normal queue then the singles queue would move very fast. In the singles queue, you will also not have the glasses until your turn comes as compared to the normal queue. This is probably to differentiate people between the two queues so don't even bother trying to jump queues halfway. 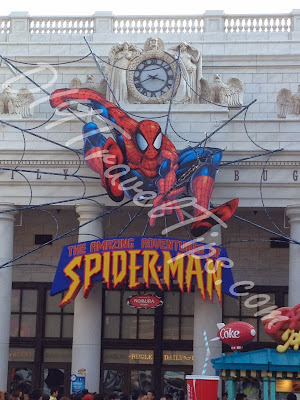 The ride was a showcase of 4D effects while you follow Spiderman around fighting the baddies. Personally I do not think there is anything scary in turns of plunging heights and stuff. Even the scene of you moving up and falling down to the streets was basically a visual effect. 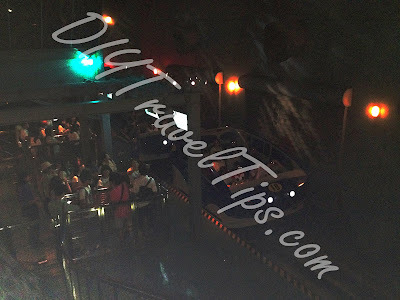 Tip for Spiderman ride - After the ride is finished, one of the staff will gather everyone from the car into a line and start speaking in Japanese while pointing to two paths, left and right. The right path is to exit. The left path beside the children room actually allows you to take the ride again with minimal waiting time. I waited 10 mins for the second round. 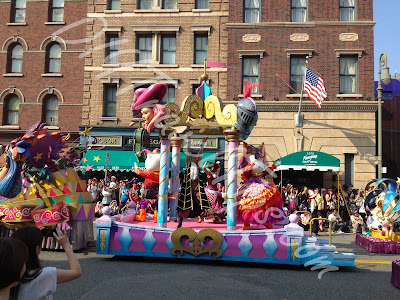 No wonder the ride had such long wait time because many people gladly took up the second chance. On the second time, I was able to look at the effects in detail. I even noticed Iron Man at the side while the car was moving around. Spiderman was of course narrating in Japanese if you have not guessed as much. We came out of the ride just in time to catch the street procession. 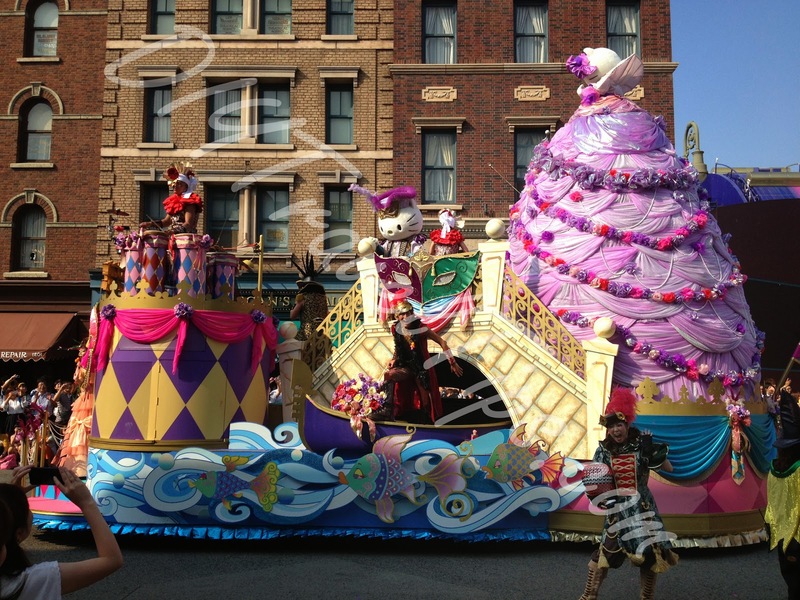 It was a great crowd draw and the performers were throwing necklaces to the audience, causing lots of frantic grabs. We next went for the Terminator 3D show. The beginning had a cursory performance from a lady in red who had a crazy laugh. The actual show was funny to hear Arnold with the Japanese dub. It was noticeable that the effects were dated when compared to Spiderman ride. There was nothing much else to do at this time while waiting for the 6pm Sadako events to start. 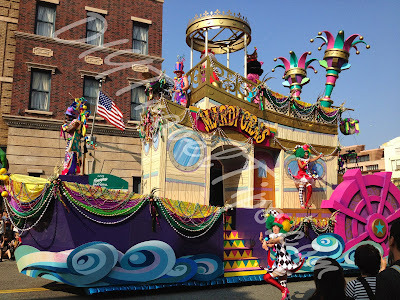 A few shows and rides had already stopped in preparation for the event and the rest were just too long to wait. By now, there are vehicles parked in the middle of road to announce the upcoming night event. 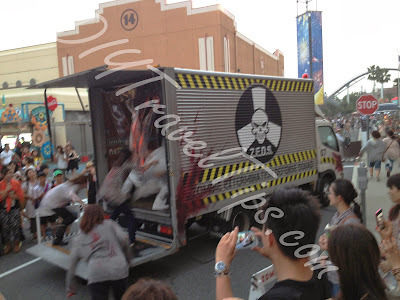 The shows and rides which had the Sadako events are Space Fantasy, Terminator, Backdraft, Jurassic Park and Jaws. If you do not know about the history of Sadako, catch the Japanese version of The Ring (not the English one) before you go for the events so that you can appreciate the scares better. It was still sometime away so we joined the Woody Woodpecker show and basically sat through the Japanese dialogue between the author, his colouring team and his boss. Audience was then ushered to another room where there was a one man show between a guy acting as a junior staff interacting with Woody. It was basically a show for kids but I was impressed at how the guy disappeared from the stage at the end. 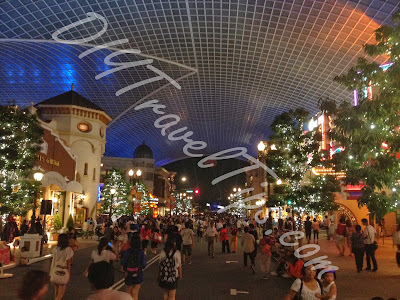 We exited the show at about 5.30pm and saw people running towards the Terminator theater on the opposite side. Looks like the show was starting early! So we ran and managed to join possibly the first screening of the event. Everything started same as the normal performance. A different lady in red from our earlier show but it was the same performance, even the crazy laughter. But very quickly the performance took a turn with the TV screens snowing and flickering announcing the start of Sadako event. Sadako even made a quick appearance to screams from the audience. We were then ushered to the main hall of the usual Terminator show. Tip for the Sadako event - When you enter the main event hall, the seats are divided into two main sections (front and back) with a barrier in the middle. For the brave and looking for a quick surprise, move to the second half. From behind the barrier, get a seat in the middle of second row so that you are facing center of the stage. I was at that position and was in for a surprise midway into the show. For the weak-hearted ones, skip that area and aisle locations. Without spoiling too much, I must say that the Sadako version of Terminator show made good use of the props available. 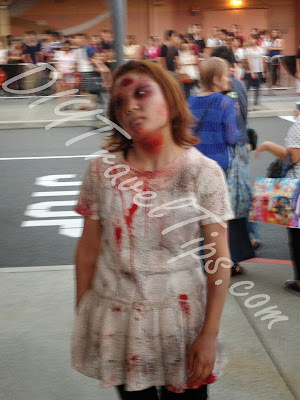 I could feel the scare moments coming but still thoroughly enjoyed it; screaming Japanese girls were just bonus. For the show that I attended, there was a slight glitch towards the end where the doors opened too early for the next batch of audience. 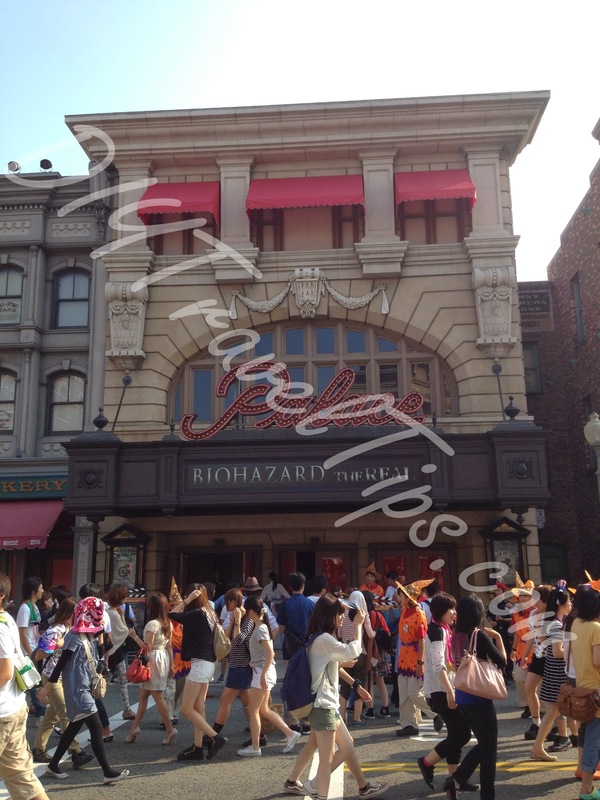 The staff were caught surprised and trying to stop them from entering. But this was probably because it was the first screening of the event. Otherwise the whole event was good. We exited the area and quickly went to Space Fantasy just next door which also had a Sadako version, but the wait time was a staggering 120mins! After joining the queue for a while and sensing no movement, we left the queue. 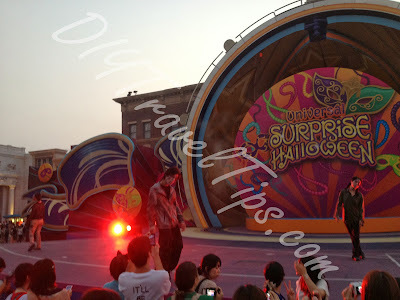 By now it was already past 6pm and the Halloween Horror Night event was officially started. 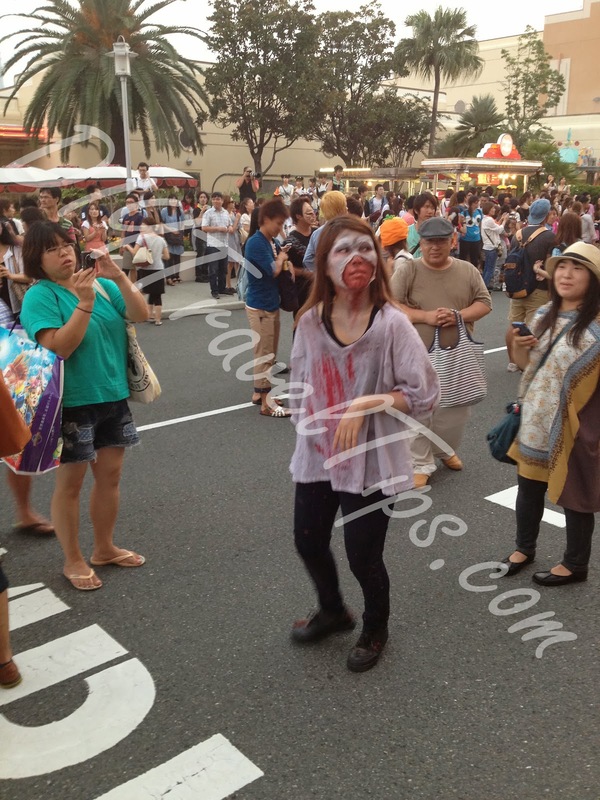 "Zombies" were walking the streets and doing their best to scare the crowd but they will never touch the people. Halloween Horror Night - "Zombie"
There were also "Zombie Exterminators" trying to catch these zombies. 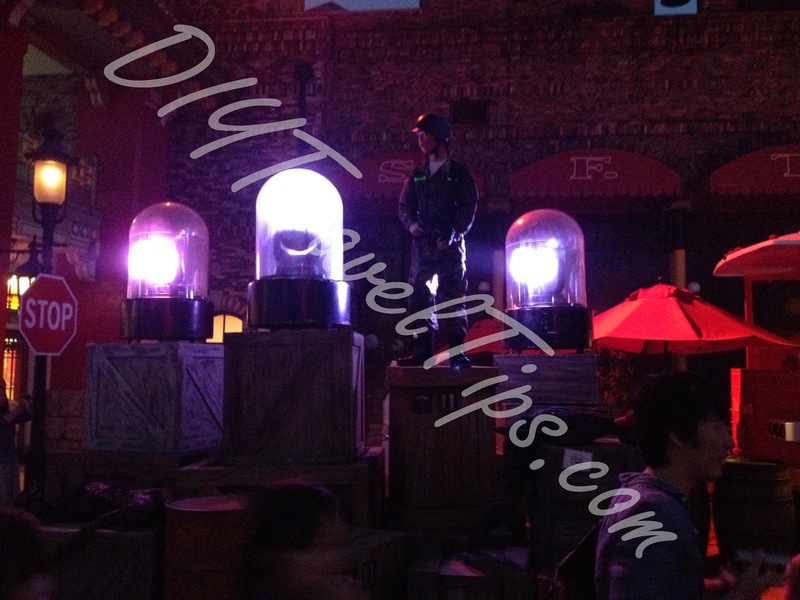 Some even went around "scanning" the crowd for virus infection. 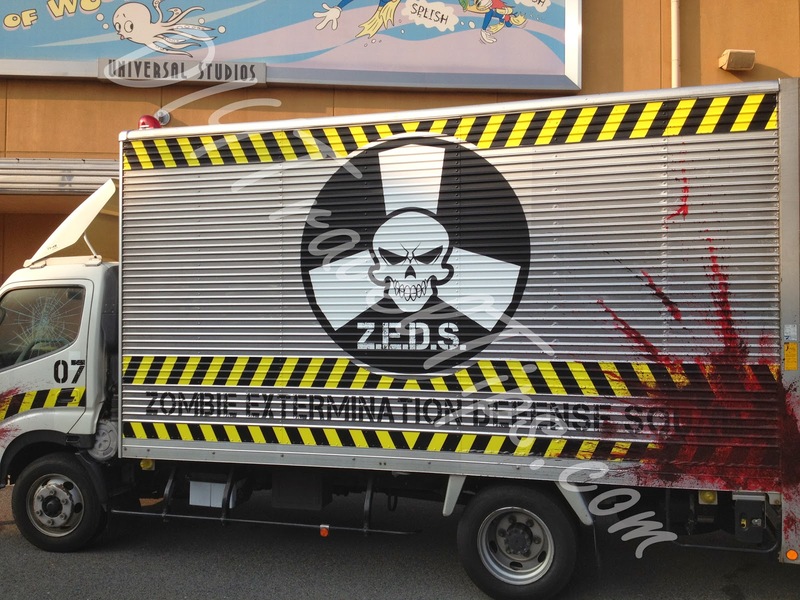 There were staged acts where the zombies "attacked" the exterminators in the truck. After taking some photos, we decided to catch the Backdraft Sadako show. It was mainly about the background story of Sadako. 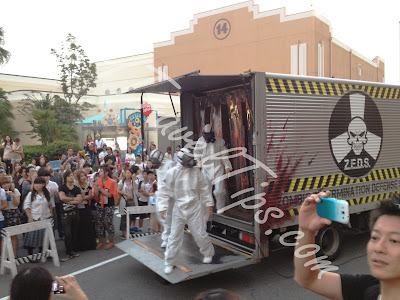 The event area was not as big as the Terminator hall so the scares were quick and limited and we were disappointed after having waited for about 40 mins. Finally we tried the Jurassic Park Sadako version. We were made to walk a longer path than usual which was of course dark. Everyone was waiting for the sudden jumps and scares but the only scary section was a Sadako figure which you could already spot beforehand. 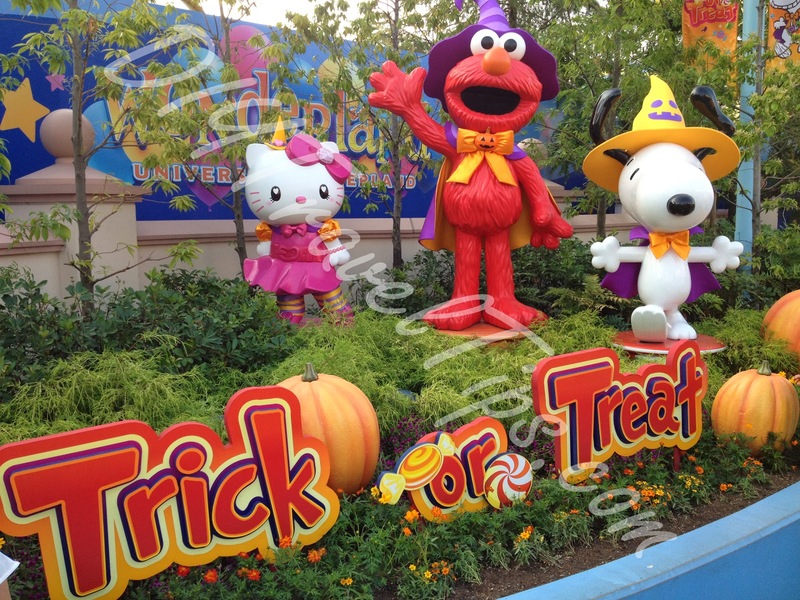 The ride itself was still the usual route and Sadako made limited appearances along the route. Towards the end of the ride, Sadako makes the final appearance in front while you plunge down the waterway. All in all a quick ride without much scare. You have limited time from 6 to 9 pm for the Sadako events so I recommend going for the Terminator version which also has the shortest wait time of all. Skip Backdraft and Jurrasic Park and try out the other events available. Of course for the families with young children, there was a declared "Safety Area" from entrance to the kids Wonderland area. We left at 8pm, hungry and tired. 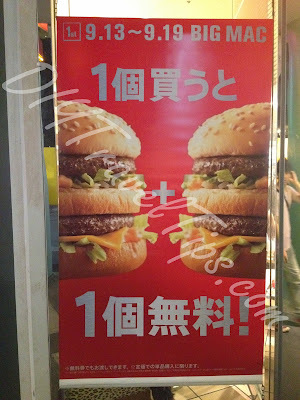 Luckily MacDonalds was nearby and having a promotion - 1 for 1 Big Mac! Thanks for the wonderful tips. 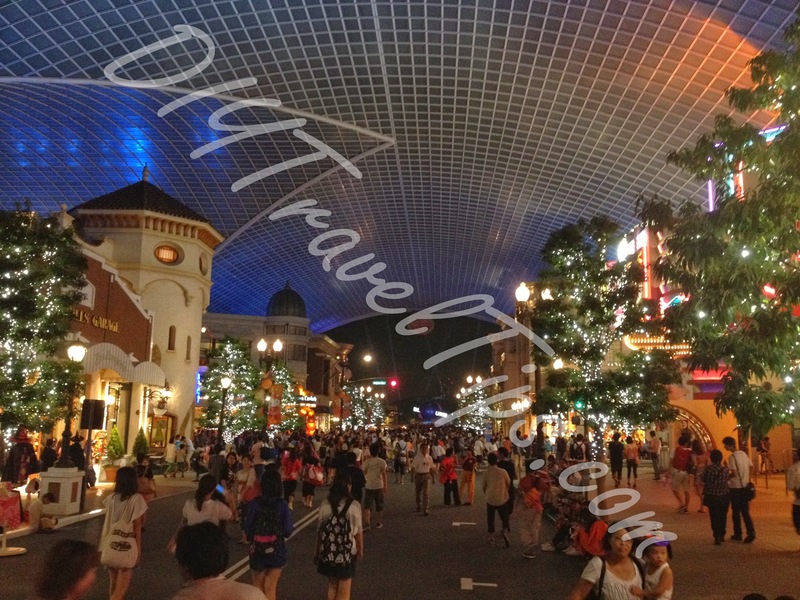 We are visiting USJ soon and these tips will definitely come in handy.